Some of our sterling silver necklaces (Best Friends, Mother and Daughter and Big Sis, Lil Sis) have multi-piece pendants that are designed to be broken into 2 or 3 necklaces. 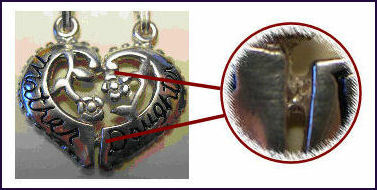 If you are thinking of buying one of these breakaway necklaces, please read these notes carefully on how to split the pendant into its different parts without damaging it. As the pendant is solid sterling silver and the pieces are joined with a very small filament of silver, you should be able simply to bend the pieces with your hands to separate them. You can see the filaments in the picture below. Alternatively you can take two pairs of pliers and place one on each piece of the pendant you want to separate. 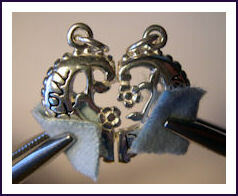 You must put a cloth around the pendant piece under the jaws of the pliers so that you do not scratch the silver. Then gently bend and tease the pendant pieces apart. See the picture below. There should be no rough edges on the seperated pendant at all - but very rarely there may be a tiny little rough piece of silver. You can remove this by very carefully filing the edge until it is smooth. A couple of strokes with an abrasive like an emery board should be enough. You must take care not to scratch the face of the pendant. If you are unsure about any of the above or you would like to return a pendant for us to separate, please get in contact.